SENSORY SENSITIVE COOKING CLASS by Lauren Leible, Pharm D Candidate & Dr. Sandra Bollinger. Health Priorities invites you to come and learn some tips & tricks for incorporating nutrient dense ingredients into foods that your child will love! 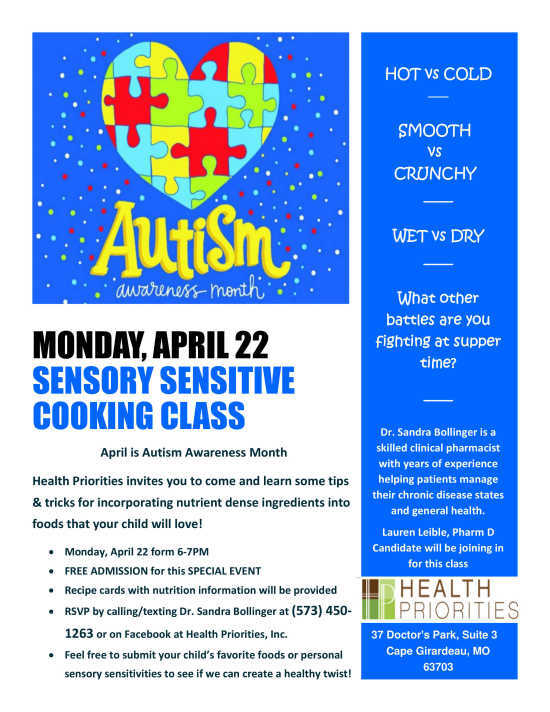 •	Monday, April 22 from 6-7 p.m.
•	RSVP by calling/texting Dr. Sandra Bollinger at (573) 450-1263 or on Facebook at Health Priorities, Inc.
•	Feel free to submit your child’s favorite foods or personal sensory sensitivities to see if we can create a healthy twist!